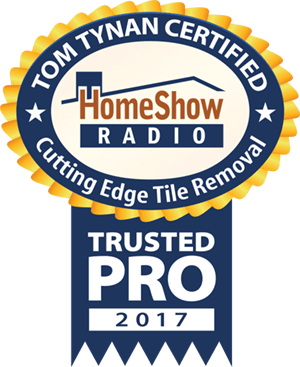 Cutting Edge Tile Removal – Our name says it all. 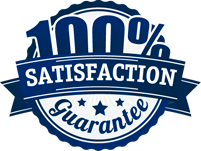 We are on the cutting edge of technology for flooring removal services. 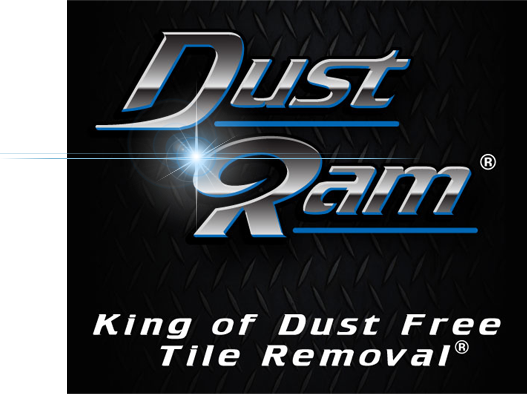 We are the only factory certified contractor in Houston for the patented DustRam® dust free tile removal system. Our trained technicians, and technologically advanced system, guarantee an unparalleled tile or stone removal project. No other contractor can come close to removing materials systems with this high level of cleanliness and dust capturing ability. CERAMIC TILE REMOVAL NO DUST! NO MESS! Most homeowners do not know that the traditional processes and tools used to remove ceramic or porcelain tile, as well as various stone material floors in their home, can be dangerous to their health, family and pets. (Click here to read about the hazards of crystalline silica dust). This is in addition to the dust and mess that contaminates your home when the process is completed by contractors with inadequate or antiquated equipment. Many contractors do not tell you about the dust or fail to adequately mitigate the mess that will be created in your home for you to be responsible for cleaning up. Professional cleaning services can clean the home of most of the dust, usually with 3 or 4 return visits for follow-up cleanings, since the dust continues to move around the home through operation of the heating and cooling systems. Duct work cleaning companies will remove most of the dust that enters through vents and registers but if there is still dust on walls and ceilings, this will eventually find its way into the ducts again. Typically, 500-600 pounds of dust are created when chipping and grinding 1,000 square feet of tile and thinset, even more if your home has Saltillo or stone tiles. Some Contractors attempt to reduce dust by installing fans in windows to extract the dust from the interior of the home but heavier dust particles fall to the floor. Plastic sheeting and tape may be used to cover doorways, openings, furniture or belongings but it is difficult to fully achieve or maintain an air tight seal. Consider what happens to the dust that has actually settled on the plastic when it is suddenly torn away to be removed. Even techniques using water or water sprays only capture some of the dust and clean-up of the dusty water usually leaves behind a residual amount of dust that will become airborne once the water has dried. At Cutting Edge Tile Removal, we provide you the peace of mind that once the project is completed, you will not have to deal with the cleanup and potential health issues left over from a dusty tile removal for months to come. Using our DustRam@ System Equipment that captures the dust at the source, the dust cannot get airborne and contaminate your home. Absolutely no dust in the air means your duct work, cabinets, closets and drawers will not be infiltrated by dust, nor will your draperies, furniture and carpets be covered with fine dust particles. Please call us today to discuss your flooring removal project! I am so glad we decided to use Cutting Edge Tile Removal when removing over 700 sq ft of tile. I am amazed that all the countertops are clean and there's no dust on anything. The company was so easy to work with. It was definitely money well spent. Amazed!